Beautiful place, the lights are amazing! Enjoy your trip and have a great Wordless Wednesday! such a beautiful cathedral. 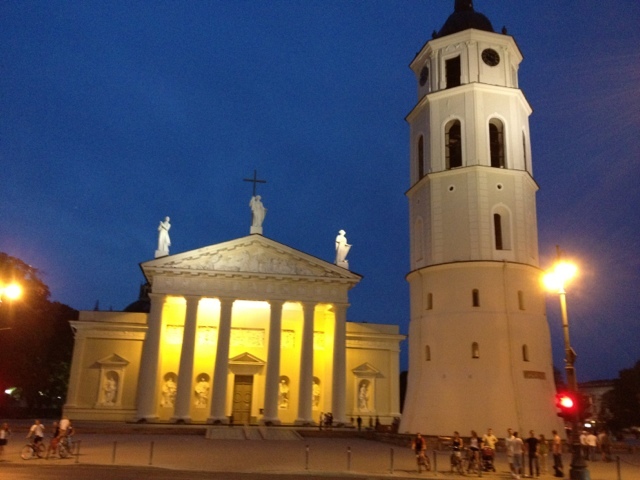 hope you enjoyed your time in Lithuania. I love the color of the sky in the photo. Enjoy your trip! Amo il colore del cielo nella foto. Buon viaggio! great light, deep sky, angels among peoples..love this photo! Thanks for stopping by my blog. Great photo-would love to see Lithuania someday. I hope you are enjoying your trip. Thank you for visiting my blog. Beautiful! Glad you are having a great time. Very beautiful and full of atmosphere ! Great photo and great photographer!! When you'll be back, in our next "cousins-dinner" we have to look at our holiday's photos!